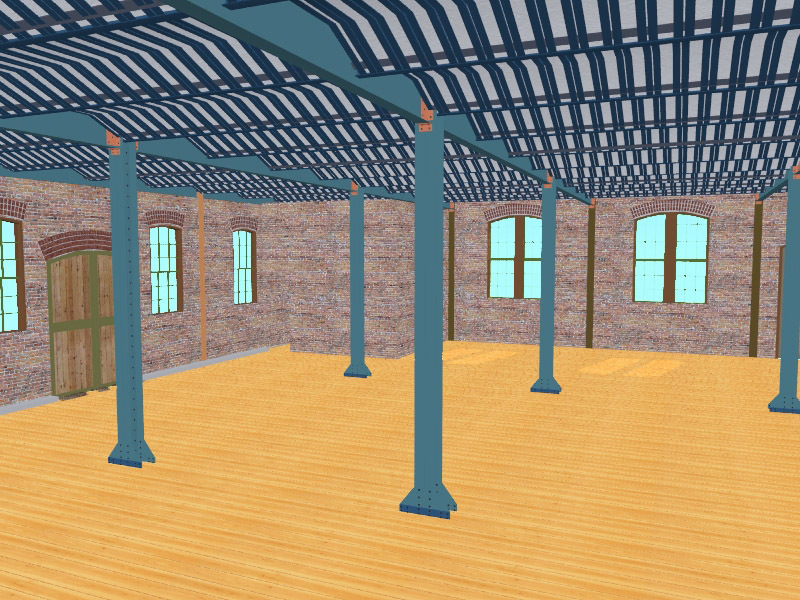 The following illustrations show the first floor from the interior of the building. 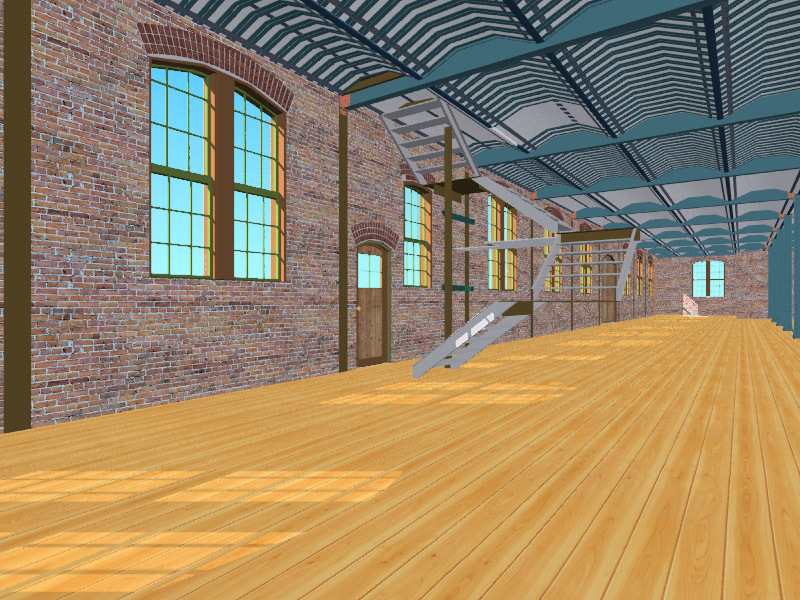 The stairwells will be shown as well as the general layout of the open space from the south to the north wall. 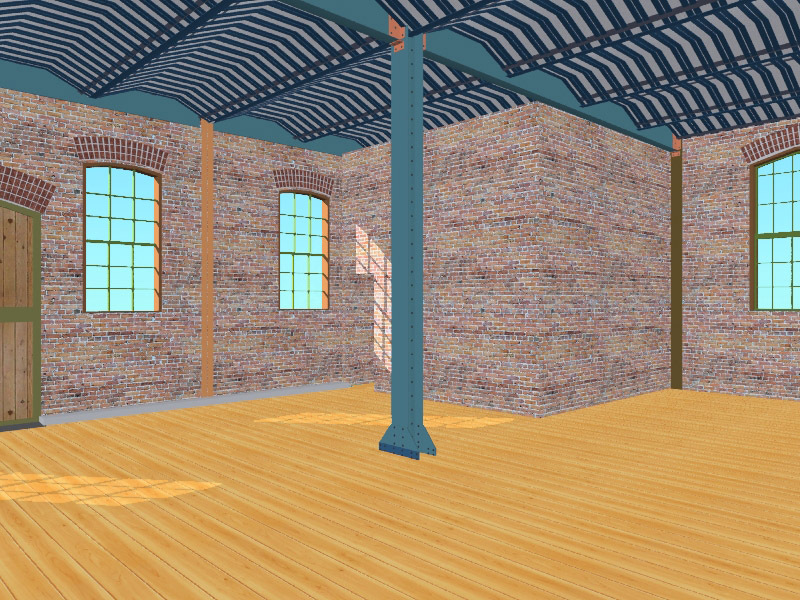 In some illustrations the plaster over the ceiling supports is shown, in other places the plaster is missing. Showing the plaster work completed would hide certain construction details to be explained. There were forty main central vertical columns which formed the core of the building and distributed the weight of the structure to the ground. These columns were arranged twenty to a row. These illustrations begin at the south wall and Stairwell-1 and proceed northerly to Stairwells-2 and 3. Stairwell-3 is located at the rear or north wall of the building. 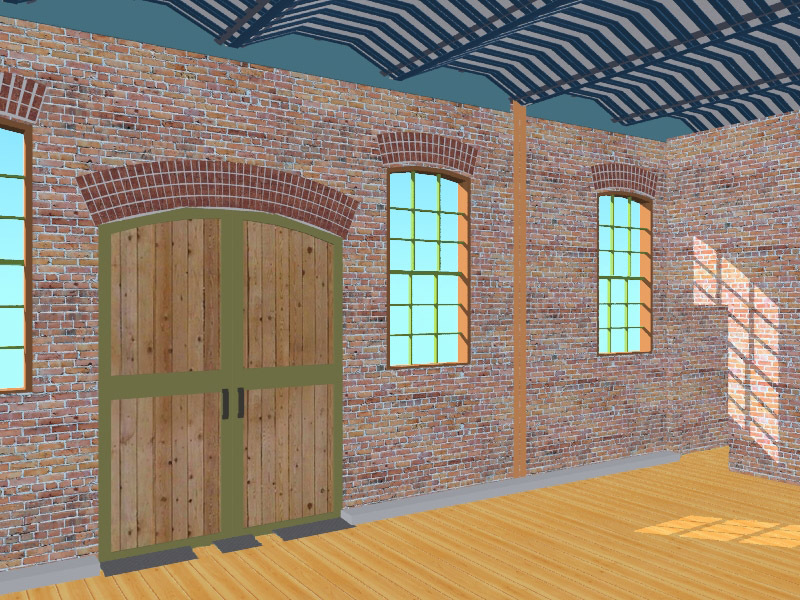 This view looking southwesterly shows the south wall on the left, and Stairwell-1 in center. The wall in the background is the west wall of the building. In the foreground are some of the main vertical columns of the structure. 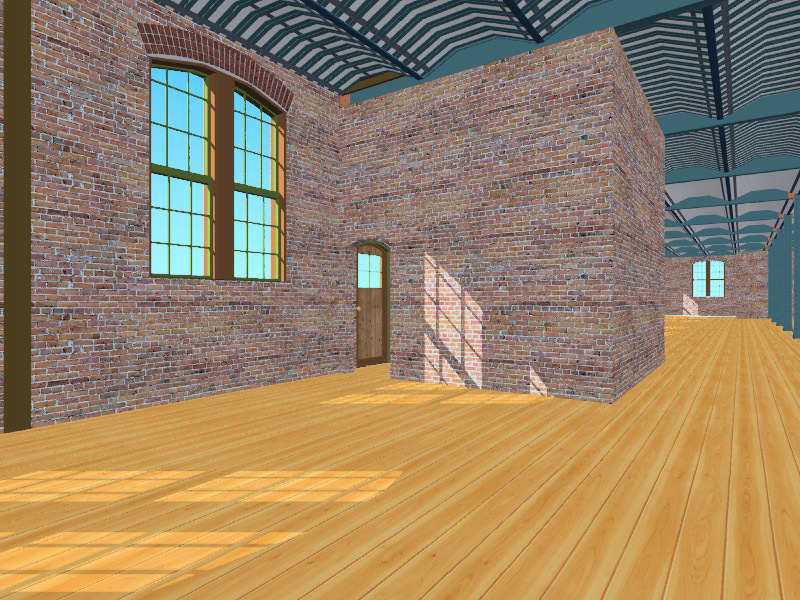 This view shows the entrance to the first floor from Stairwell-1, the window light illumines the entrance at the south wall. Originally there was also an entrance at the west wall, but it was bricked in when the boiler and compressor were added to the building. On the stairwell wall near the window on the right in this image, an unknown artist painted an image of the face of the former President of the United States, Ronald Reagan. 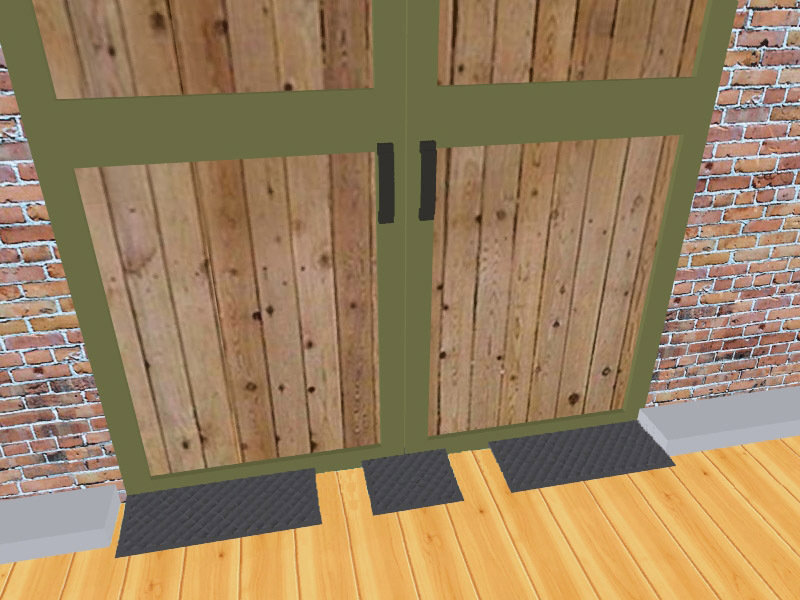 Double doors opened to the center of the first floor. Stairwell-1 is to the right. The main central doors in the south wall had provision for narrow gage track, leaving an eight-inch space on either side of the central metal plate. This narrow gage track was for rolling carts or platforms to move material through the building. In the area of the south wall and Stairwell-1 a large air compressor and boiler were added to the building after the original construction. From photographs it appears the original wooden flooring was removed and concrete poured to support the weight of the foundations supporting the equipment. 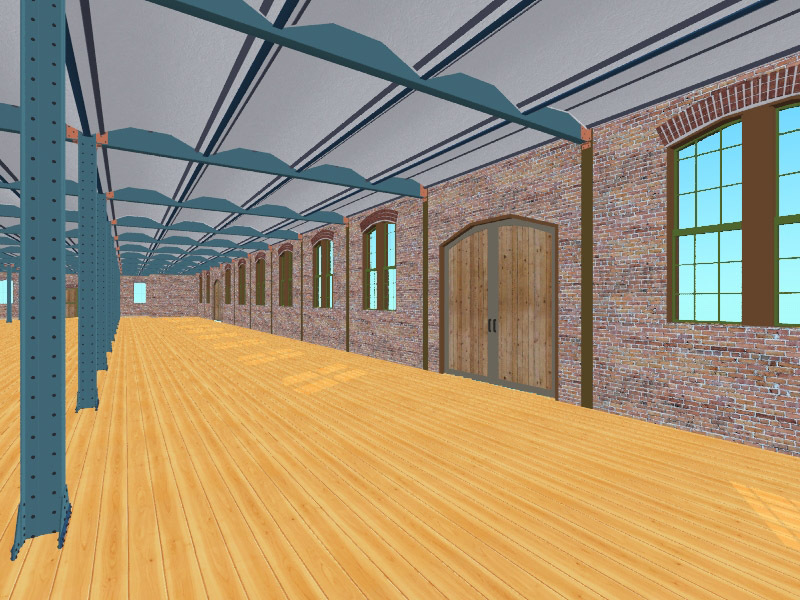 The illustration above shows wooden flooring which may have been there prior to the equipment being added. Interior view of Stairwell-1. Door directly ahead is the entrance into Stairwell-1 from the exterior of the building. The widow to the left of the door is to let light into the corridor leading to the first floor entrance way at the south wall. This view is looking towards the south wall. Along the west wall, on the right of this image, can be seen the windows and two sets of large double doors opening to the first floor. This image shows the entrance to the first floor from Stairwell-2, located along the west wall. The doorway entrance through the west wall is visible in the near center of the image through the first floor entrance from Stairwell-2. 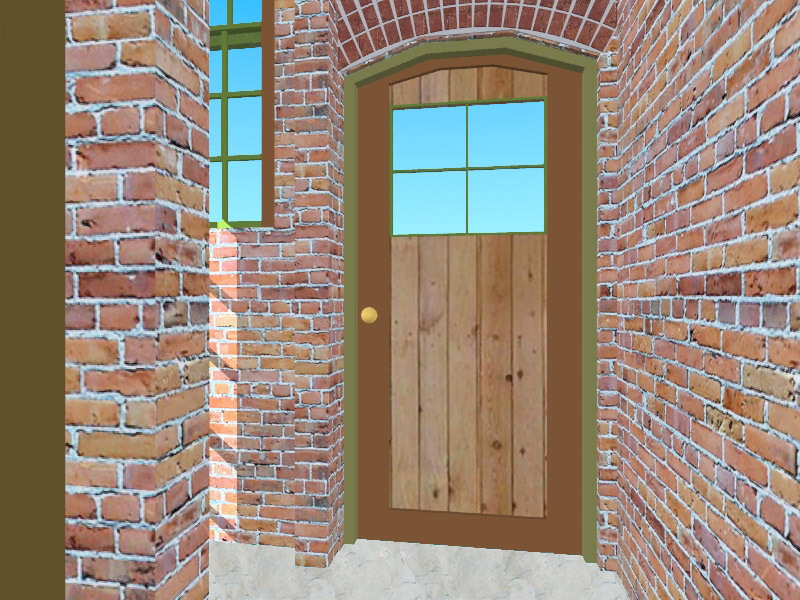 This image shows the stair arrangement and the door and window which are within Stairwell-2. 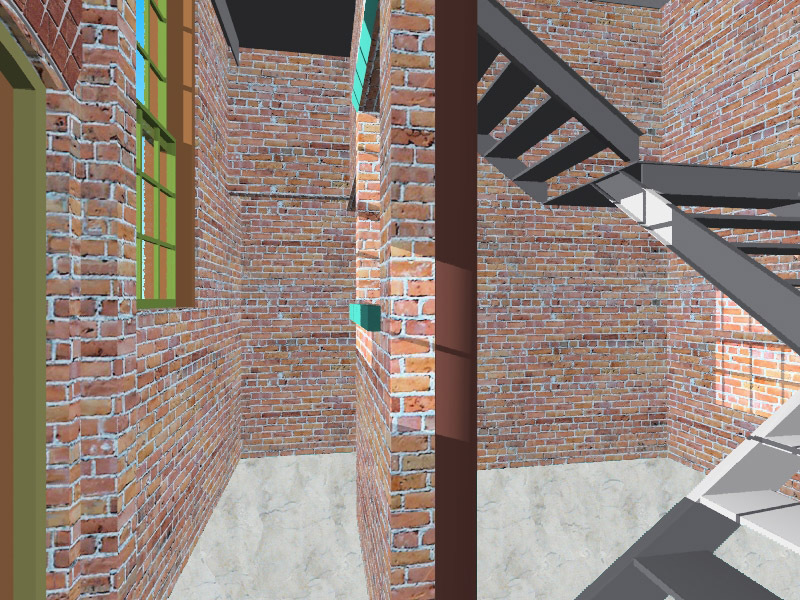 Brickwork of Stairwell-2 is not shown in this image.